"The House of Murgatroyd, or Ruddygore Revisited" is a 7-person re-imagined version of Gilbert & Sullivan's operetta, "Ruddigore", which will be premiered at The 21st International Gilbert and Sullivan Festival in the United Kingdom in August 2014. 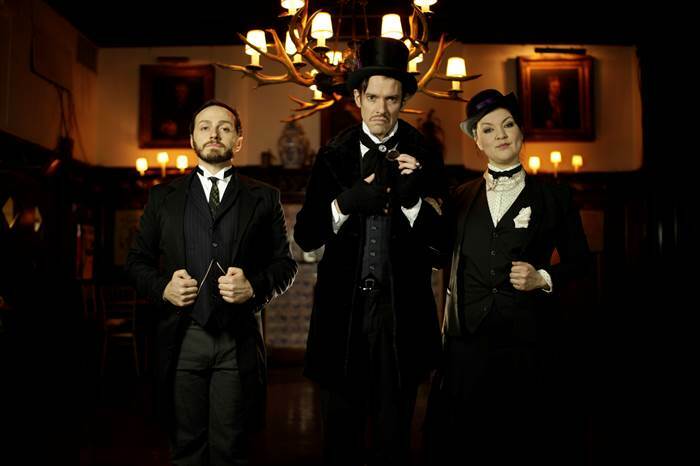 "The House of Murgatroyd", is a seven person re-imagining of the Gilbert and Sullivan classic "Ruddigore", which will make its world premiere at The 21st International Gilbert and Sullivan Festival in the U.K. in August 2014. It has been been pulled apart, cut to bits, reassembled and resurrected to include material that was cut after opening night, a new song featuring W.S. Gilbert's lyrics, and a few other surprises that will have to be seen to be believed. Curses, passion, love and lies plague these players as they wind their way through Gilbert's take on British Melodrama, set to Arthur Sullivan'sclassic score. Does the apple fall far from the tree? Can a bad Baronet escape his title and attendant curse by becoming a simple farmer? Can a poor mad maiden ensnare the love of a wicked villain? Can a self assertive sailor sever the bond of star-crossed lovers? Can the ancestral picture gallery of Rupert Murgatroyd's demented descendants determine the destiny of them all? Oh Joy, Oh Horror, watch as these characters swing to extremes in the blink of an eye. We will be sharing our work, and hosting a talkback session after the performance with international Gilbert and Sullivan scholars, professional performers, amateur performers, and fans, in order to provide a discussion on the lasting impact of the comedic satire of Gilbert and Sullivan, and how their work can impact our modern-day thoughts on society, politics, and human nature. Our performance will be part of the largest gathering of the works of W.S. Gilbert in over 100 years. We have successfully assembled a cast of NYC’s most talented Gilbert & Sullivan, musical theater, and theater performers, and our production team features designers and directors with impressive international credits. Your support is essential in allowing our talented cast and production team to share their work at The 21st International Gilbert & Sullivan Festival, please help us embark on this international journey!